So what is it then? 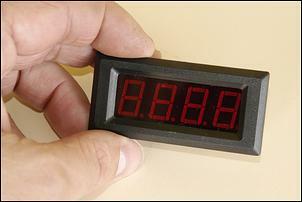 It’s a four-digit LED battery voltage meter that looks great. Plus it’s easy to put together and won’t break the bank. 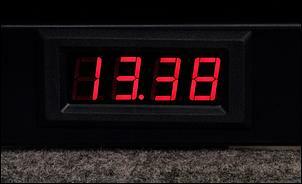 There are a few electronic components to assemble but 95 per cent of the hard work’s already been done for you in the shape of the off-the-shelf LED digital panel meter. The meter is Jaycar cat no QP-5580. It costs just AUD$26.95 and boasts those four digits, a super-bright and very accurate 14.2mm high LED display, and a configurable decimal point position. Unlike some meters, this one is also happy measuring the voltage being used to run the meter – when asked to do this it won’t have kittens, as many meters in this situation are prone to do. 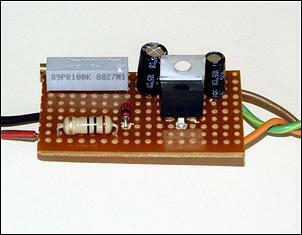 The meter needs a regulated 5-volt power supply and reads to a max of 200mV (ie 0.2 volts). Now these two specs might look kind of daunting – since you want to power it from the running car voltage of 13.8V and you want to be able to measure up to that voltage as well – but they’re both easily fixed. First up, the power supply. We’ve deliberately over-rated the power supply so that you can run multiple meters from it. That means you can not only monitor battery voltage, but also use extra LED displays to do other things (which we’ll cover another time). In addition to supplying a regulated 5V, the power supply is designed to protect the meter from the voltage spikes that can occur in car electrical systems. It is largely the same as the one we used in our ‘TempScreen Part 4’ TempScreen: Part 4 - Building a Custom Temperature Display article of <?xml:namespace prefix = st1 ns = "urn:schemas-microsoft-com:office:smarttags" />Dec 7, 1999, which was also designed to run a digital display. The 5 volts is provided by a 7805 voltage regulator (12 volts in, 5 volts out) and this works with 10 and 100uF electrolytic capacitors, a 1W 18 volt zener diode and a 10 ohm 1 watt resistor. This circuit shows how these components go together. Note the pin-outs on the voltage regulator and the fact that the capacitors and zener diode have a polarity (ie go into the circuit only one way around). The capacitors have the negative lead marked on their bodies, and the orientation of the diode is indicated by the band on its body which corresponds with the band on the diagram. The voltage regulator will grow quite warm with the load – you may want to place a small heatsink on it, especially if you’re running multiple displays. Build the circuit on a piece of punched board, physically laying it out just as the circuit is drawn. This will reduce the chance of making mistakes. 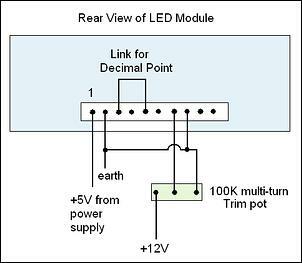 When you’ve finished, apply 12V and earth and measure the output, which should be very close to 5V. You may notice an extra component on the board – a 100 kilo-ohm multi-turn trimpot, which we’ll come to in a minute. The display is easy to hook up. As the instruction sheet shows, there are ten pins on the back of the LED meter. Pin 1 is marked. Pin 1 connects to the +5V provided by your power supply and Pin 2 to earth. To trigger the decimal point in the correct position, connect Pin 3 to Pin 5. A 100 kilo-ohm multi-turn trimpot is used to divide down the voltage to suit the input range of the meter. One side of the pot is connected to car battery voltage, and the other to earth. The centre pin (the wiper) connects to the positive signal input of the meter, Pin 7. Pin 8, the signal ground, connects to earth. We mounted the display and power supply in a plastic box. When you apply power and earth (both to the power supply and the meter’s input via the pot), the LEDs should come alive but not yet show anything meaningful. However, by turning the pot you should be able to bring up numbers on the display. Use a digital multimeter to measure the input signal voltage and then very carefully adjust the pot until the two meters agree. Let the system run for 10-15 minutes and then again check the relationship between the two meters. The pot may need a slight tweak after the system has warmed up. 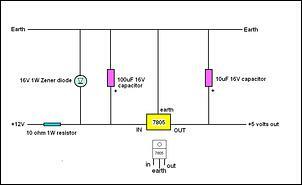 Easiest is to feed the same source of power to both the 5V power supply and also the meter’s input. That is, the meter is powered from the voltage it is measuring. However, in some cases you might want to do it differently. For example, if you want to measure the real-time voltage at a car sound amp, power the 5V power supply from an ignition-switched 12V supply and connect the meter’s signal inputs to the amplifier’s constant 12V and ground. That way, you can measure the actual voltage at the amplifier – but when the car is turned off, the LED display won’t needlessly stay on. 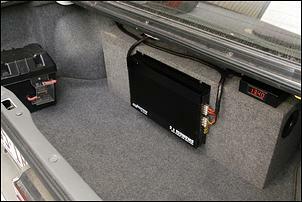 These parts and prices are from Jaycar Electronics www.jaycar.com.au in Australian dollars.